“What good is it, my brothers and sisters, if someone claims to have faith but does not have works? Can this kind of faith save him? If a brother or sister is poorly clothed and lacks daily food, and one of you says to them, “Go in peace, keep warm and eat well,” but you do not give them what the body needs, what good is it? It costs less than £1.00 to feed each child daily. 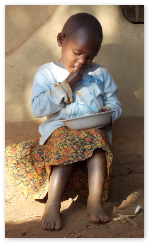 You can’t imagine what a huge difference your little can make to children who are accustomed to going days without food. With your help we can promise each child the next meal and the one after that, and so on. We can give them that hope. It is possible together! It is heart-breaking to watch the children sleeping on bare floors shivering and coughing as the nights grow colder. 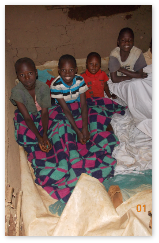 We need blankets, beds and mattresses. Your donation will enable us to provide them with better housing and access to basic health care in a community where the nearest hospital is some 50 Km away. 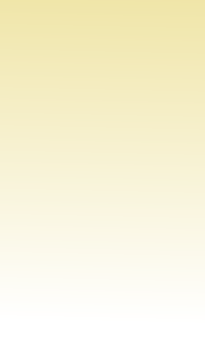 The annual primary school tuition fee per child is 8,000.00 Kenya Shillings (less than £70.00). Please sponsor a child and bless them with the opportunity to break away from the poverty circle in which they are trapped. The siblings Kevin and Fenah (pictured) are two of our children on their way to school. Help us to help more of them and to sustain the help. 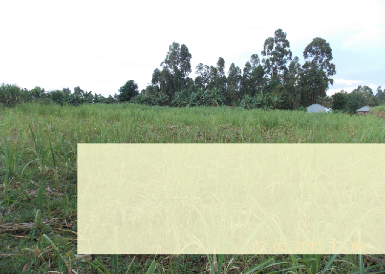 This is the land in Kenya on which we hope to build an orphanage and school. 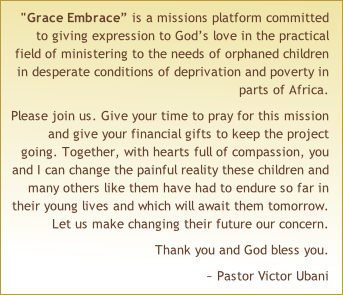 Together we can turn this dream into reality and be a blessing to many children in so doing. 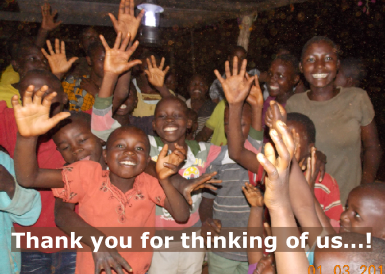 God bless you as you consider partnering with us on this project.